Pass & Seymour on-Q® 1-Port RJ45 IDC Keystone connector features 22 - 24-AWG Category 5e T568A or T568B cable for reliable connection. The wall mount connector in orange color, has high impact plastic construction. It has a dimension of 1.28-Inch x 0.64-Inch x 0.87-Inch. 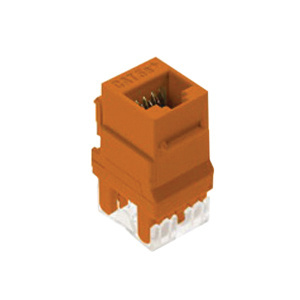 The vertical design of this connector offers easy punchdown termination. It has storage temperature rating of -40 to 158 deg F. Connector is UL/cULus listed, CAN/CSA certified, RoHS compliant and meets ANSI standards.